The Star corresponds to the Hebrew letter Tzaddi, roughly meaning those who are faithful to God. Tzaddi’s literal meaning is that of capturing – such as the light of the Lord captures the hearts of mankind. The shape of the original pictograph is that of a man bent down in humility, who has yet been crowned (in the more recent book-script) – the symbol of the attitude and rewards of the faithful. The letter Tzaddi also is associated by some kabbalists with the mate of the letter Aleph, which in the Tarot pertains to the Fool – implying that the Fool is trusting in the Star’s guiding light. The Star represents the calm after the storm; the faithful (Tzaddik) have passed through the terrors of the Tower and survived, and are rewarded with a vision of peace and serenity. Astrologically, the Star is equivalent to Aquarius, which is one of the Stable Sun Signs, signifying security after growth. Aquarius is also the sign of creativity and originality, which come as a result of being able to apply what you’ve learned to reality through the granting of peace and quiet. The images on the card illustrations evoke a sense of calm and serenity; both of them feature a woman pouring water out of two cups – one in each hand – into a pool of water (a sea in the case of the Thoth art) before them. The pool of water is still, save for the water running into it from the cups. Stars dot the background of both cards, with one large, yellow star in the background of the Rider-Waite card, and a planet dominating the background of the Thoth card. The Thoth card’s colors are a blue hue, associating it with calmness and passivity. The idea of flowing permeates the Star. The cups of water seen in the illustration – which in the Thoth art at least appear to be bottomless – represent the transfer of energy, specifically from the realm of the spirit (the upper cup to the planet) to the mortal realm (the lower cup to the sea). This energy can be any kind you can think of; creative, spiritual, emotional, and even physical. 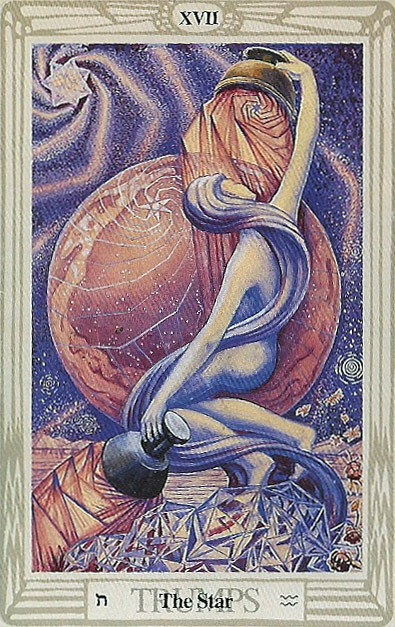 The most potent energy this card refers to, though, is that of life; the Star represents the heavens pouring life down onto the Earth. This life that flows from the heavens is infinite, and so this card symbolizes eternal renewal, as well. This is a very Taoist card, like the Hanged Man, urging you to go with the flow. It represents calm, peace, and serenity. It asks you to step back and take a break – and as you rest, a new source of inspiration (like the muse of an artist) will come to you, a sort of guiding light – like the north star is. It asks you to trust in your inner spirit – the same inner guide that Tarot readers rely on to read the cards. The Star advises you to listen to your instincts, and not to let yourself get too worked up about something. Just let it happen; if you have faith, then everything will turn out alright. It provides a sense of hope for all who heed its call, and reminds us that there is always a solution to all of our problems. On the Tree of Life, the Star sits between Netzach (Bliss) and Yesod (Essence of Being), representing the guiding light achieved through experience helping one to discover who they truly are, channeling the energies of blissfulness in order to help you become all that you can be. This entry was posted on June 30, 2011 by Z. M. Wilmot. It was filed under Tarot .